All across the state cities are struggling through a housing crisis. The Tahoe area is not immune to the problem as housing prices continue to rise and local businesses struggle to find employees capable of surviving on the wage provided to them. “We know that we’ll always have tourism, but we still need to take care of the people that serve this community,” said Stacy Caldwell, chief executive officer of the Tahoe Truckee Community Foundation. “The number one most important issue I hear on a daily basis is housing,” said JT Chevallier, Executive Director of the Tahoe City Downtown Association. “I want to own a house here. I want to start a family here. A 2016 Tahoe Truckee Housing Needs Assessment reported that 65 percent of homes in the area are vacant, mainly used for vacation homes, and that 58.6 percent of the local employees commute into town. It also reported that the median home price in 2015 was $538,000 and estimated the maximum home price considered as “affordable” to a four-person lower income household is $235,000. With the average household income in North Lake Tahoe at $67,000, buying a home is not a feasible option for many. Renting a home can be just as difficult, with an estimated wait time for an affordable housing unit around six months to two years. In order to accommodate the future workforce an estimated 12,160 housing units are needed, according to the report. In June of last year, the Mountain Housing Council, created by the Tahoe Truckee Community Foundation, established a three year initiative to find solutions to housing struggles in the region. Comprised of 29 partner organizations, including Placer and Nevada counties, the council has worked for the past year identifying spaces for affordable housing projects and developing methods of funding the projects. According to representatives of the Mountain Housing Council Stacy Caldwell and Seana Doherty, there are currently 304 achievable housing units that are underway in North Lake Tahoe, including the Artist Lofts, Coburn Crossing project, Meadow View Place and the Tahoe City Marina apartments. The council used the term “achievable housing” to define all projects that it is currently working on which could be designated as affordable or market rate. The Artist Lofts project, currently being developed at the Truckee Railyard, plans to provide 76 units of affordable housing and 13 at market rate. Coburn Crossing, which recently broke ground will provide 138 rental units, with Meadow View Place set to provide 56 low-income units and Tahoe City Marina with 10 rental units, eight low-income and two at market rate. Doherty said that when moving forward the council will focus on developing a variety of housing types not exclusive to single families. These could include mobile or tiny homes, condos and townhomes, multi-family homes and co-living spaces. 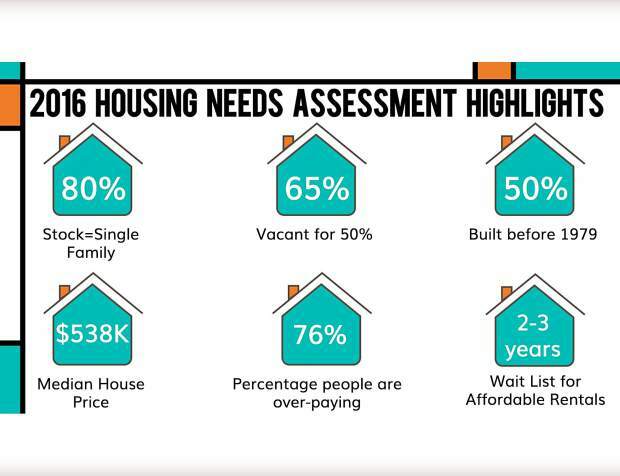 Currently, 80 percent of housing units are single-family use, according to the 2016 Tahoe Truckee Housing Needs Assessment. Another challenge the housing council faces is having to work with multiple special districts across land with three separate jurisdictions. Doherty said they want to create one regional agenda that the entire community of North Lake Tahoe can work together on. Placer County Board of Supervisors Member Jennifer Montgomery suggested the county create a position with the sole responsibility to work across the entire county to help create affordable housing options. “It’s more than a full-time job to address this problem,” she said. In addition to government assistance, the Housing Council requests community input and support.